We are specializing in the production of plastic ball, Solid Plastic Balls, Hollow Plastic Balls, Small Plastic Balls, Hard Plastic Balls, Toy Plastic Balls, Precision Plastic Balls, Clear Plastic Balls, PP Plastic Balls, PE Plastic Balls, POM Plastic Balls, PA Plastic Balls. Our plastic balls precision achieved +/-0.02 to 0.001 mm, without the mold lines, without the burrs, the surface is smooth, the high quality. We will provide for the high precise products to our customers. 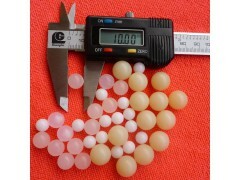 Plastic balls main sizes: diameter0.3mm, 0.6mm, 0.8mm, 1mm, 1.5mm, 2mm, 2.38mm, 2.5mm, 3mm, 3.175mm, 3.97mm, 4mm, 4.763 mm, 5 mm, 5.5 mm, 5.56 mm, 6 mm, 6.35 mm, 6.5 mm, 7.144 mm, 7.938 mm, 8 mm, 8.731 mm, 9.525 mm,10 mm, 11.113 mm, 12.7 mm, 15.87 mm, 19.05 mm, 25.4 mm, 30mm, 35.2mm, 38mm, 40mm, 45mm, 50mm, 55mm, 60mm, 65mm, 70mm, 75mm, 80mm, 85mm, 90mm, 95mm, 100mm, 127mm, 150mm, 200mm. China Lucky is a service oriented company that values each and every customer. Our dedicated sales professionals have the experience and expertise to provide technical information and quotations regarding our Plastic Balls. We production personnel and sales staff work together closely to ensure that orders are correctly processed and shipped on time to meet scheduled delivery requirements.